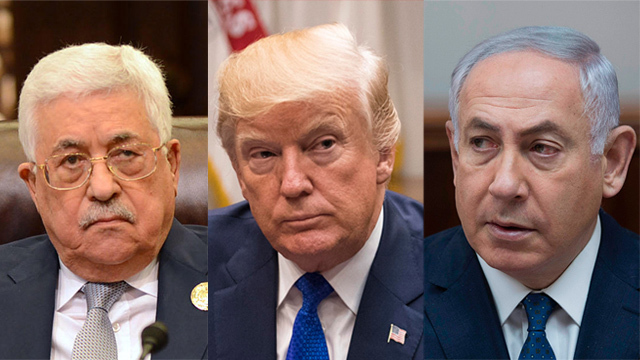 The White House is considering presenting President Trump’s Middle East peace plan even if the crisis with the Palestinian Authority continues and Palestinian President Abbas refuses to come to the negotiating table, senior U.S. officials tell me. After Trump’s Jerusalem announcement on December 6th, Abbas announced he would cut ties with the U.S. over the peace process. The Palestinians also boycotted Vice President Pence’s visit in the region. Abbas claimed Trump is not an honest broker and called his peace plan “the slap of the century”. Meanwhile Israeli Prime Minister Netanyahu said he will react to the Trump plan after he sees it but stressed he is ready to renew peace talks. U.S. special envoy Jason Greenblatt held a series of meetings with Netanyahu, his advisers and several ministers over the last two weeks. Greenblatt also met with opposition leader Hertzog and briefed EU member states representatives in Tel-Aviv and East Jerusalem. He did not meet with any Palestinian officials but met with Palestinian students and private sector executives. On Wednesday, Greenblatt participated in an emergency meeting of the donor countries to the Palestinian Authority. The meeting focused on the crisis in the peace process and on the humanitarian situation in Gaza. The Palestinian Prime Minister Rami Hamdallah also participated in the meeting. It was the first time senior Palestinian and U.S. officials were around the same table since the Jerusalem announcement. Greenblatt and Hamdallah shook hands but didn’t hold a meeting. In his speech during the plenary meeting, Greenblatt referred to Hamdallah and said he hopes that the fact he is participating shows the Palestinians are still committed to the efforts to renew the peace process. Greenblatt also said President Trump’s announcement was just a recognition of reality and the connection of Israel and the Jewish people to Jerusalem. Greenblatt also said in his speech: “Did the President’s decision prejudge any final status issues? No. We have not taken a position on borders”. Greenblatt stressed that the Trump administration continues drafting its peace plan and called on the Palestinians to return to the peace talks: “Peace will not be achieved by walking away from negotiations. It is easy to walk away from the table. But that helps no one, and it reduces or perhaps eliminates the chances of achieving a comprehensive peace agreement. And that would be terrible for the Palestinian people”. Categories: Palestinian "culture of peace"
According to John Calvin (formerly “Jonaid Salameh,” before his conversion to Christianity), an EMET fellow who was born in Nablus, from the very earliest age, he ‎was taught there would not be two states, but one state called Palestine. An important slogan on everyone’s tongue in the disputed territories is “Lama neharherah,” meaning “When we free ‎it” — and “it” is all of Israel. Surah 8, verse 38 of the Quran says, “Tell the unbelievers that if they desist from evil, their past shall be forgiven and if they revert to their past ways, then it is well known what happened with the people of the past.” According to Calvin, the interpretation is clear: There should ‎be conflict until all worship is only to Allah. In former U.S. President Bill Clinton’s autobiography, “My Life,” he describes how profoundly disappointed he had been with then-PLO Chairman ‎Yasser Arafat after generous offers were made to the Palestinian leader by Prime ‎Minister Ehud Barak in the Camp David negotiations. Arafat did not respond in the affirmative or the ‎negative, but simply walked away from the table. His response came several months later, in the ‎form of the Second Intifada. Thanks to Abbas’s falsehoods, his media continues to this day dishonestly to talk about “Jewish invaders and settlers storming” Islamic and Christian holy sites in Jerusalem. This and this alone is the source of the knife and car-ramming attacks against Israelis. Perhaps by a “culture of peace” Abbas means calling — as he and his top officials regularly do — Israel an apartheid and racist state. Or maybe “culture of peace” means calling all Jews “occupiers” and “colonists” — or denouncing and threatening Palestinian children who play soccer with Israeli kids. Or naming schools and electoral lists after convicted murderers? Under Abbas, anti-Israel incitement and indoctrination is a business that has expanded exponentially. It has, in fact, grown to the point that a new generation has been raised on the glorification of jihadists — a generation impatient to draw yet more Jewish blood. If this is Abbas’s “culture of peace,” one has to wonder what he would consider a culture of war? Abbas did not provide further details about the “culture of peace” upon which Palestinian children are being raised. Nor did anyone bother to ask Abbas or any member of his entourage to provide examples of the “culture of peace” in Palestinian society. Yet major Western media outlets were quick to publish Abbas’s unmistakable lie. Apparently, like his predecessor, Yasser Arafat, Abbas is convinced that Palestinians can fool “all of the people, all of the time” about their true goals and intentions. Arafat lied to Presidents George W. Bush and Bill Clinton when he told them that he and the Palestinian Authority were promoting peace and coexistence with Israel. Under Arafat, anti-Israel incitement in the Palestinian media, schools and mosques intensified until Palestinians waged the Second Intifada in September 2000. This intifada was the result of seven years of vicious incitement and indoctrination that came after the inception of the PA. In a truly ironic turn of events, the Oslo Accords, signed between Israel and the PLO in 1993, gave the Palestinians media outlets, including television and radio stations, which were then used to amplify hatred against Israel and Jews on a daily basis. Arafat used these media outlets to tell his people — when then Israeli Prime Minister Ariel Sharon visited the Temple Mount in September 2000 — that Israel was planning to destroy the al-Aqsa Mosque. It was precisely this incitement that triggered the Second Intifada, in which Palestinians wage a massive and ruthless campaign of suicide bombings and drive-by shootings that caused the death of hundreds of Israelis. Only one week before the Abbas’s meeting with Trump, the PA president’s Fatah faction called on Palestinians to take to the streets and clash with Israeli soldiers and Jewish settlers. The call was made in “solidarity” with Palestinian prisoners who went on a “hunger strike” in Israeli prisons. The hunger strike was not about Israel’s prisons, well-known for being among the most comfortable in the world; the hunger strike was actually a political move to compete for which terrorist would be Abbas’s successor. The prisoners are terrorists, most of them with blood on their hands; the more blood, the higher the promotion. In the fight for Palestinian leadership, being a “graduate” of an Israeli prison is far more important than being a graduate of the University of Texas at Austin. The Palestinians’ former prime minister, Salam Fayyad. Fayyad, an economist and reformer adored in the West, received only 2% of the Palestinian vote. By calling for clashes with Israelis, Fatah is inciting Palestinian youths to carry out violent attacks against Israeli soldiers and settlers. This is the same Fatah led by Abbas — the same Abbas mouthing lies about a “culture of peace.” By voicing solidarity with convicted murderers and praising them as role models and heroes of Palestinians, Abbas’s Fatah pushes Palestinian youths to follow in their footsteps and engage in violence. One day after the Abbas-Trump meeting, the current Palestinian Authority prime minister, Rami Hamdallah, participated in a rally in Ramallah, in solidarity with the hunger-striking terrorists. At the rally, Hamdallah affirmed the PA’s full support for the terrorists, by saying he was working to bring their case to the attention of the international community. Like Arafat, Abbas continues to use alleged but non-existent threats the al-Aqsa Mosque to incite Palestinian youths against Israel. For the past 50 years, non-Muslims, including Jews, have been permitted to visit the Temple Mount as tourists. The visits were suspended when the Second Intifada began in 2000. But since the tourist visits resumed a few years ago, the Muslims have been trying to keep Jews away from the holy site. The Muslims claim that Jews are seeking to “destroy” and “desecrate” the al-Aqsa Mosque (on the Temple Mount) — a false claim that is added to the long list of lies and blood libels spread by Abbas and many Muslims. Abbas’s statement came in response not to any incidents at al-Aqsa Mosque, as Abbas and other Palestinians claimed: Tours of Jews to the Temple Mount are routine and peaceful. Shortly after this statement, Palestinians began waging a campaign of knife and car-ramming attacks against Israelis, in a violent insurgency known as the “Knife Intifada”. “We will protect Jerusalem and we will not allow them [Jews] to defile al-Aqsa (Mosque) and the Church of the Holy Sepulcher with their filthy feet,” Abbas deceitfully announced. Ever since Abbas’s inciting statement, however, dozens of Palestinian youths have heeded his call by going out to stab or run over the first Jew they see. Their blood is on Abbas’s hands. He is the one who sent out the youths to “protect” al-Aqsa Mosque against the fictitious Jewish “invaders.” He is the one who continues falsely to talk about “herds of settlers storming al-Aqsa Mosque” — in reality, peaceful routine visits by Jews to the Temple Mount. Thanks, however, to Abbas’s falsehoods, his media continues to this day dishonestly to talk about “Jewish invaders and settlers storming” Islamic and Christian holy sites in Jerusalem. This and this alone is the source of the knife and car-ramming attacks against Israelis. This, evidently, is the “culture of peace” to which Abbas is referring. How can he utter such a staggering lie when his media and top officials continue to delegitimize Israel and demonize Jews on a daily basis? How precisely is Abbas promoting peace when his Palestinian Authority names schools and public squares after Palestinian terrorists with Jewish blood on their hands? Earlier this year, for example, Abbas’s Fatah named a youth camp in Jericho after Dalal al-Mughrabi, a female terrorist who killed 38 civilians, 13 of them children, and wounded more than 70, in 1978. Abbas talks about a “culture of peace” at a time when he and his Palestinian Authority are even combating all forms of “normalization” with Israel. The anti-normalization campaign, in Ramallah and other Palestinian cities, targets any Palestinian who dares to meet with Jews (even “pro-Palestinian” Jews). It operates solely under the auspices of the PA government. This campaign also promotes boycotts, divestment and sanctions against Israel. Its goal is to intimidate Palestinians who work towards peace and coexistence with Israel and to ban any business with Jews. Can any Palestinian invite Jews to a meeting in Ramallah without being targeted by the “anti-normalization” thugs, many of whom are affiliated with Abbas’s Fatah? Under Abbas, anti-Israel incitement and indoctrination is a business that has expanded exponentially. It has, in fact, grown to the point that a new generation has been raised on the glorification of jihadists, a generation impatient to draw yet more Jewish blood. If this is Abbas’s “culture of peace,” what, one wonders, would he consider a culture of war?